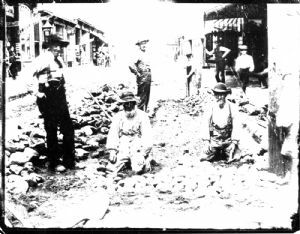 Cumberland city street crew paving North Centre Street near Frederick Street with cobblestones. This photograph is part of the Herman and Stacia Miller Collection and has been used courtesy of the Mayor and City Council of Cumberland, Maryland. It is numbered 1880 in that collection.